Our Mesh Retrieve Training Bag is quite strong and durable. Its double layer of mesh and adjustable, locking top opening makes it an easy training tool to use. The bag is small and lightweight so you can keep it in your pocket when it is not being used. 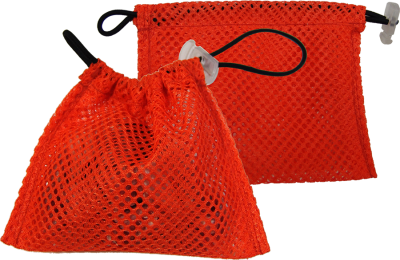 The Retrieve Training Mesh Bag was developed while training service dogs that did not want to retrieve objects. The bag works on the principle of motivating the dog to bring you an object by first wanting to take the mesh bag in its mouth because of the treats or food that you put in it. It is made from mesh which gives the food motivator, that is in the bag, the maximum amount of smell. This has worked very well for stubborn and young dogs. You start this retrieve training before you feed your dog. A hungry dog works better than a full dog. Put something scented or what the dog is crazy for in the bag and hook a leash to the loop end of the mesh bag. Pull the bungee cord top of the bag closed and throw it across the floor while holding onto the end of the leash. Be sure your dog is watching you. Throwing the bag will generally excite the dog. When your dog runs to get the treat bag, pull him/her back to you with the mesh bag in its mouth. As your dog is coming back to you, call and use the word that you designate for bringing the object. This is imprinting your dog's mind that bringing you the bag results in a reward. As soon as your dog gets to you open the bag and give your dog a treat from the bag. The reward must come as soon as your dog retrieves it. After your dog gets used to bringing you the mesh treat bag, then follow the same principal but without a leash. If your dog does not want to bring the mesh treat bag restart by attaching the bag to the leash. When this step is done successfully begin the object retrieval by attaching a lightweight object to the bag (i.e., hand towel, toy, keys, etc.). By this time, the dog is understanding that bringing you different objects means he/she will get a treat. Now try the same technique without the bag, just the object. Always mark the successful retrieval behavior with a reward (a treat at first, and then move into a pet or praise).